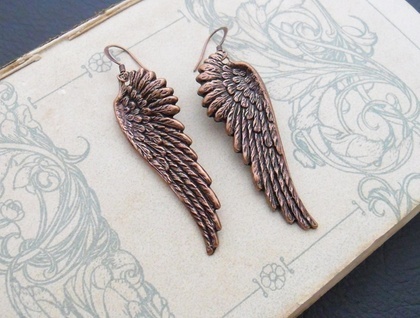 These earrings showcase copper-plated brass wings that have been oxidised or 'antiqued' to show up their beautiful, realistic feather detailing. 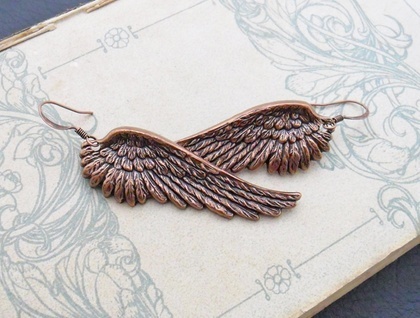 I carefully drilled the stamped wings so that they can be worn as earrings, and hung them from elegantly shaped, copper ear-hooks that are antiqued to match the wings. This is a one-off Silverlight Jewellery design. The wings are a gorgeous, rich, red copper colour – hence the name 'rufous', which means 'reddish brown', from the Latin word 'rufus' which means 'red' or 'reddish'. 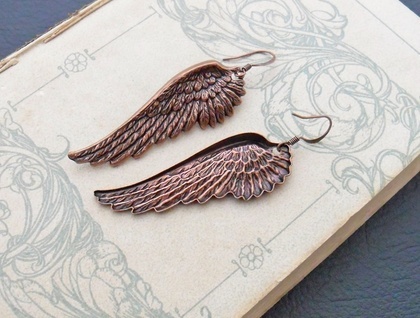 The 'Rufous Wings' earrings measure 65mm from top to bottom. They are lightweight, as the brass stampings are hollow backed as the photographs show. 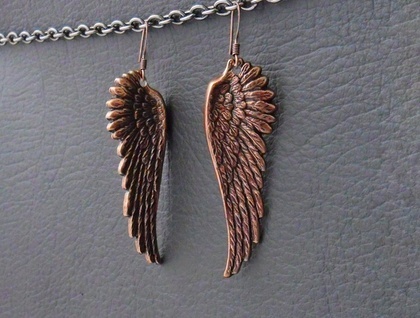 The wings measure 52mm long and 18mm across at their widest point. The earrings come with little, removable, plastic stoppers to help prevent the hooks from working their way out of the wearer's ears.